Conjure Perfume Spray & Conjure Perfume Magic! 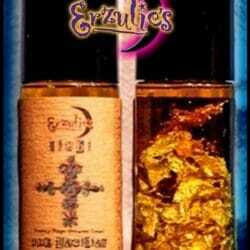 Vodou Maîtrise Perfume Oils and Conjure Perfume Sprays: For spiritual attunement, awareness and mastery! Deepen your connection to the Divine and develop spiritual mastery and attunement with this powerful, musky and exquisite magical perfume. 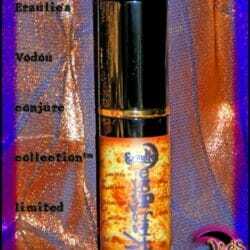 Vodou Maîtrise perfume oils are handcrafted using ancient precious oils of Superior Pink Pepper Absolute, Olibanum, Myrrh, Coriander, Benzoin, CO2 Patchouli, Musk, Iris Flowers and Rose Absolute for an exotic, smoky and creamy musk combination. Simply spray this aromatic perfume on your body to deepen your connection to the Divine, develop spiritual mastery and attunement in your spiritual path each day. 1/3 oz. 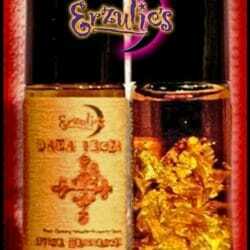 Perfume Spray with Gold & Metallic Labeling.